Japan’s current claim to Dokdo – Takeshima relies heavily on 17th Century records of voyage to the region. Dokdo is called Takeshima by Japan and sometimes Liancourt Rocks by western nations. Japan’s earliest records of Dokdo were like Korean were related to Ulleungdo Island. All historical records be it Korean or Japanese show Dokdo’s importance was inseparably bound to Ulleungdo Island. The Murakawa family became aware of Ulleungdon and Dokdo in the year 1617 after becoming shipwrecked in the vicinity. Upon arriving back in Japan Murakawa requested permission from the Shogunate to make voyages to Ulleungdo to gather the abundant resources there. A fleet of several boats boats with dozens of people were sent to Ulleungdo in the spring for one or two months and then would return to Japan when weather permitted. These voyages are what Japanese scholars now consider “management” of Ulleungdo~Dokdo. But looking more closely at the historical records it’s apparent that neither islands were really Japanese territory. 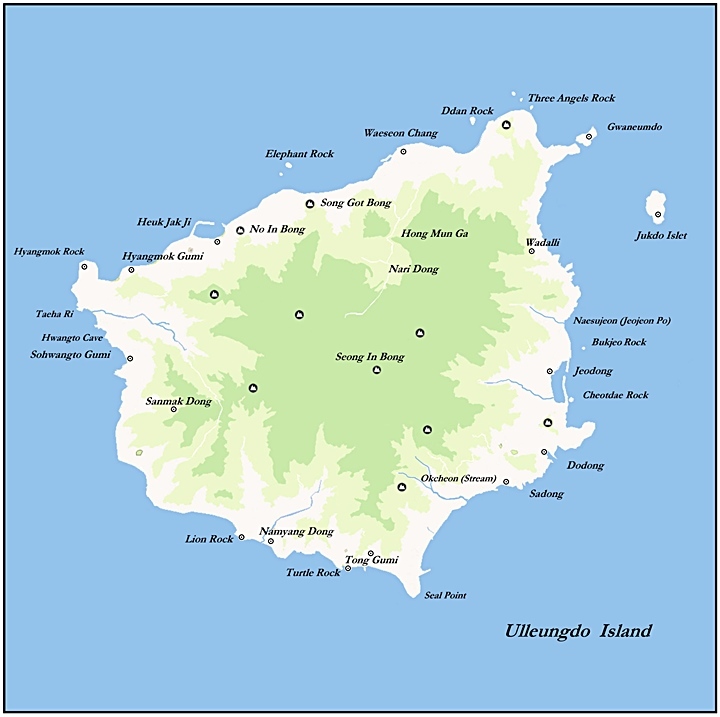 Above left: An overall map of the Ulleungdo Region. 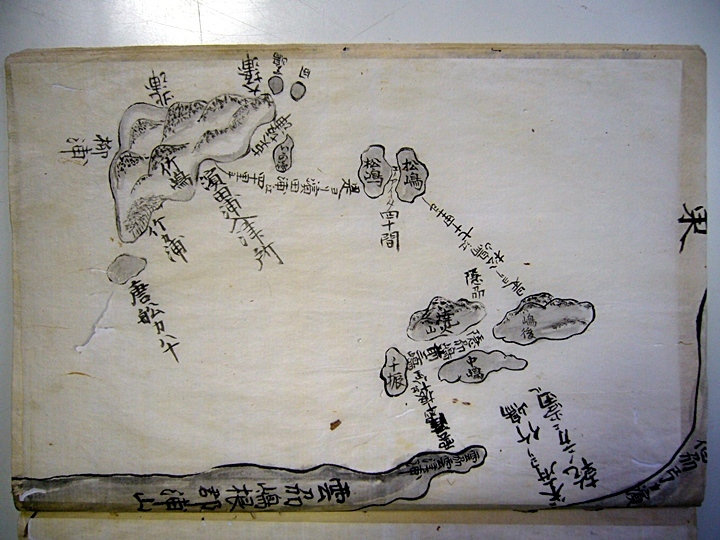 Above right: A map of Korea’s Ulleungdo Island where Japanese fishermen illegally voyaged to for around 80 years, during the 17th Century. The Japanese continued this so-called “management” for about 80 years after their intial “discovery” of Ulleungdo. This went on for so long because Chosun had maintained a vacant island policy over Ulleungdo at this time. The Japanese gathered such valuable resources such as sandalwood, paulownia, abalone and sea lion oil. However, the second part in this two-character sinitic expression, “hairyo” has the second meaning of “estate.” Therefore, “hairyo” is wrongly interpreted as “receipt or bestowal of an estate” or even “enfeoffment.” In fact, the shogunate permit was not the bestowal as gift or enfeoffment of Dokdo, but simply a license of voyage to Tokdo. Thus, the true nature of Japan’s voyages to Ulleungdo were not as management of a Japanese territory but rather as a trip to foreign country. During the 17th century the Shogunate issued voyage passes nationals who were going abroad. Such was the case with Ulleungdo Island and the Murakawa~Otani families. These familes falsely claimed the islands were “bestowed” upon them but in reality what the Shogunate gave them were voyage permits for passage to the islands. This false claim to Ulleungdo would lead to what has become to be known as “The An-yongbok Incident”. Voyage passes likethe image above were issued to some Japanese families such as Otani and Murakawa. These were not “bestowals” of territory but rather permission to visit foreign lands. These documents were also issued to Japanese going to foreign countries such as Vietnam or China. The map to the left of this text is a 1724 map made by one of the Japanese families who voyaged to Ulleungdo from Yanago, Japan. 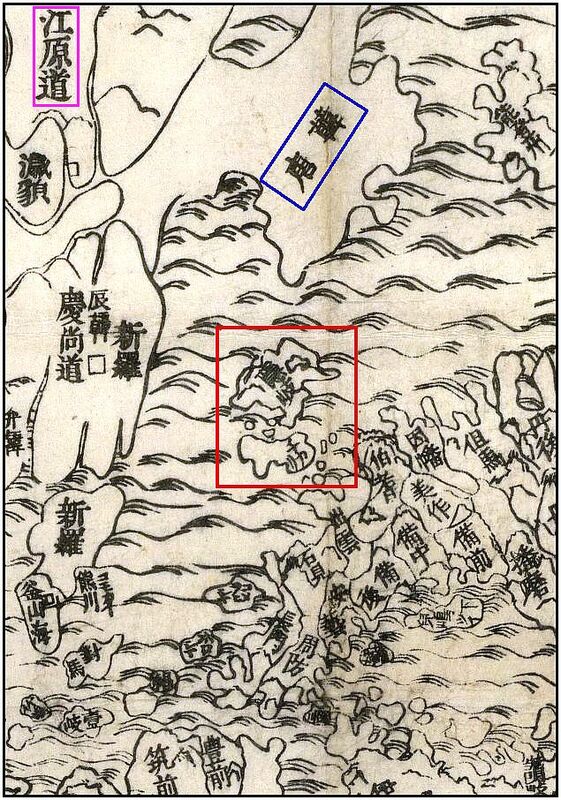 Some Japanese use these maps to claim that they are proof of title to both Ulleungdo and Dokdo but when examining the historical circumstances of this era we can see this is wrong. The date of this map is 1724 and we know that as of 1696 the Japanese Government had ceded ownership of Ulleungdo to Chosun and banned Japanese nationals from visiting the island. Given this fact these maps can be interpreted more of proof of Japanese clandestine trespassing on Ulleungdo than a legitimate basis for claim to Dokdo Island. In addition, because both Ulleungdo and Dokdo are included it is clear that this map is not any proof of ownership of the islands when referenced with the historical relationship between Chosun and Ulleungdo. Below is another private Japanese fishing map of Ulleungdo and Dokdo. Note the destination (Ulleungdo) and departure points (Yonago City) are marked. Above: These crude private Japanese fishing maps are all dated post 1696, the year Japan’s government banned passage to the Ulleungdo region. Despite this, some Japanese violated this travel ban and continued to secretly trespass into Chosun territory from Yonago City. It can be observed from this maps that Dokdo’s utility for Japanese was only as a stopover en route to Ulleungdo. Thus, when Ulleungdo was reaffirmed as Korean land Dokdo’s importance for Japan was no longer necessary. There are no historical records of Japanese visiting Dokdo Island as a sole destination. 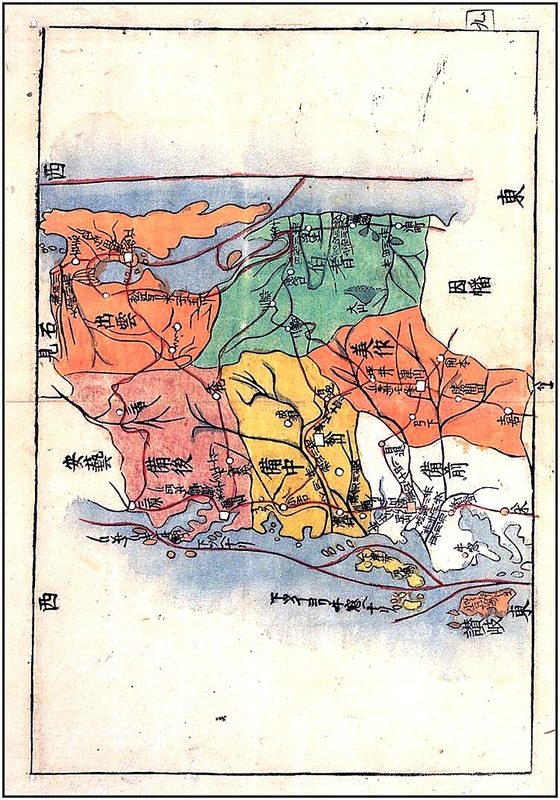 The image below is of a map discovered in a Japanese research center under the Culture-Historical Department. Professor Kim Mun-gil at Busan Foreign Language University made the map public on June 18, 2006. As mentioned Isagawa Yusen was a central figure in the area of private cartography during this era. 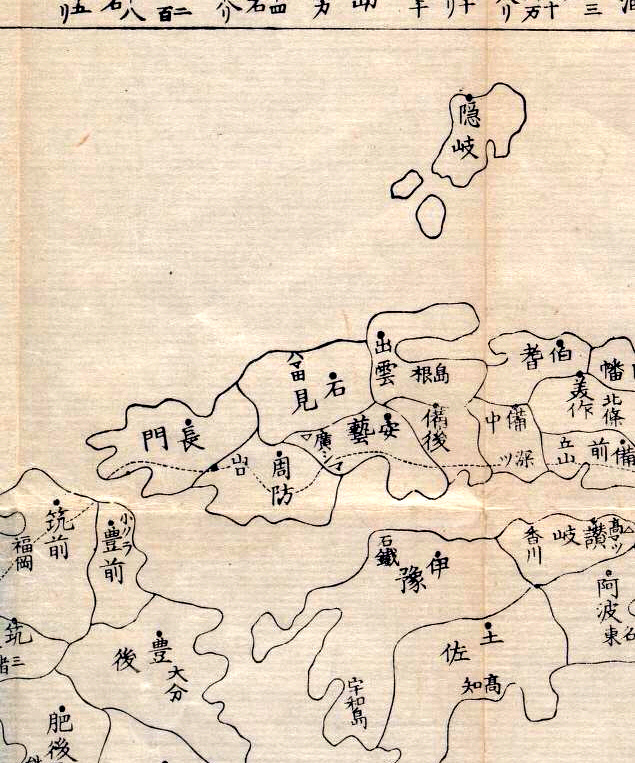 At this time private map makers were heavily influenced by the Japanese government’s official maps. Isagawa Yusen published many other Japanese national maps, travel maps and world maps as well. 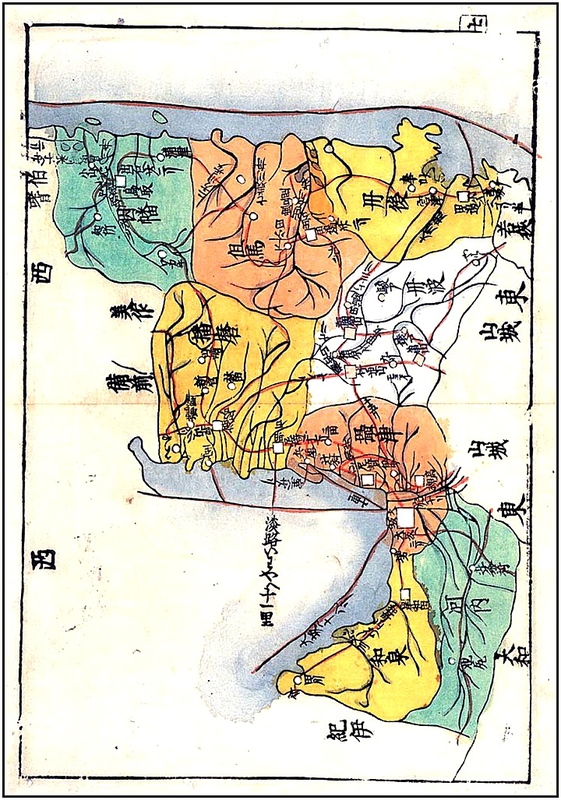 The two maps of Yusen’s on this page were so widely accepted that they were republished in 30 different editions over the course of a full century. It can be understood that these maps were an accurate representation of Japan’s territorial perceptions. Around the year 1700 Isagawa Yusen drew the above map of the world. We can see again that no Japanese territories exist West of the Okinoshimas in the East Sea. This concurs with his national map showing Handang as a separate land Northwest of Japan thus excluding both Ulleungdo and Dokdo from Japanese territory. Below a map from the 17th Century shows us exactly what area Handang extended over. 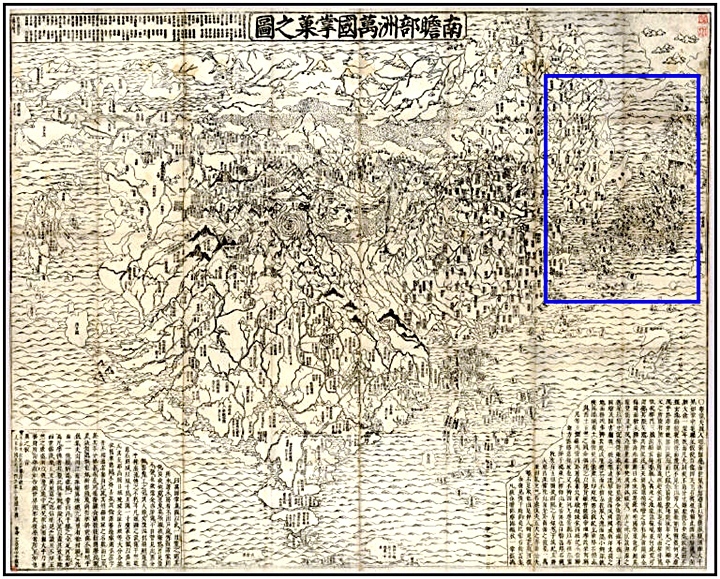 The map on the right is the entire image of Hotan’s map with northeast Asia boxed in blue. Below left shows a closer image of Japan and Korea. On the lower right we can see Japan’s Oki Island boxed in red. 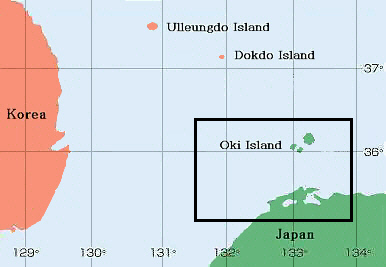 Above Oki Island is Handang northwest of Oki with the characters boxed in blue. This area would encompass both Ulleungdo and Dokdo. It is also appended to Chosun (Korea) and the characters for Kangwando Province are boxed in pink in the upper left corner. Here again we see that Ulluengdo and Dokdo were not included as part of Japan. The map above shows territory norhwest of Oki labelled as Handang and as appended to the Korean peninsula. Oki Island is boxed in red, Handang boxed in blue and Kangwando in pink. More evidence that Ulleungdo and Dokdo were not part of Japan during the 17th Century. 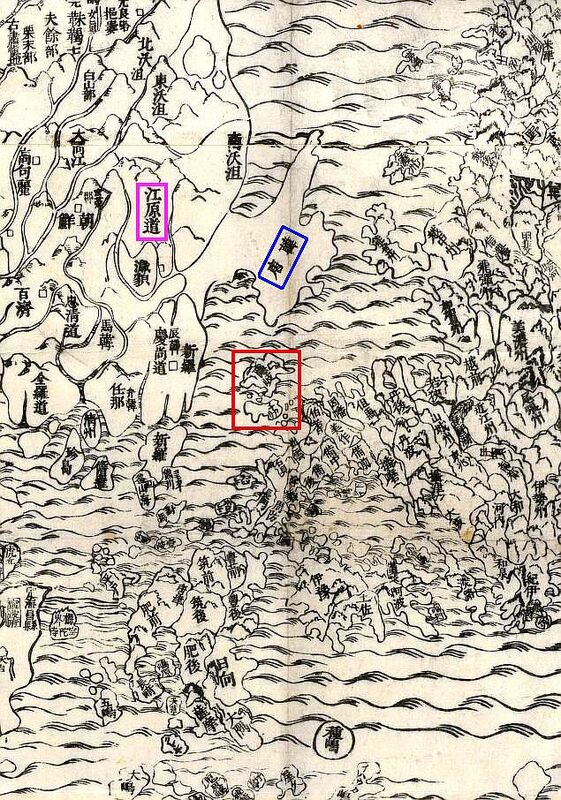 As shown all national Japanese maps drawn during the 17th century show us that it is not possible Japan had laid claim to either Ulleungdo or Dokdo during the occasional clandestine voyages of the Murakawa and Otani clans. If indeed the shogunate had “bestowed’ these lands upon Japanese nationals there would be some officially sanctioned maps either prefectural or national that would reflect this stance. Some Japanese claim that Ulleungdo and Dokdo were given to these families in the mid 17th Century. So what do more regional maps of this era tell us about Japan’s national boundaries during this time? Below is a reference map showing all of Japan’s West coast with the prefectures labelled in Kanji for reference. 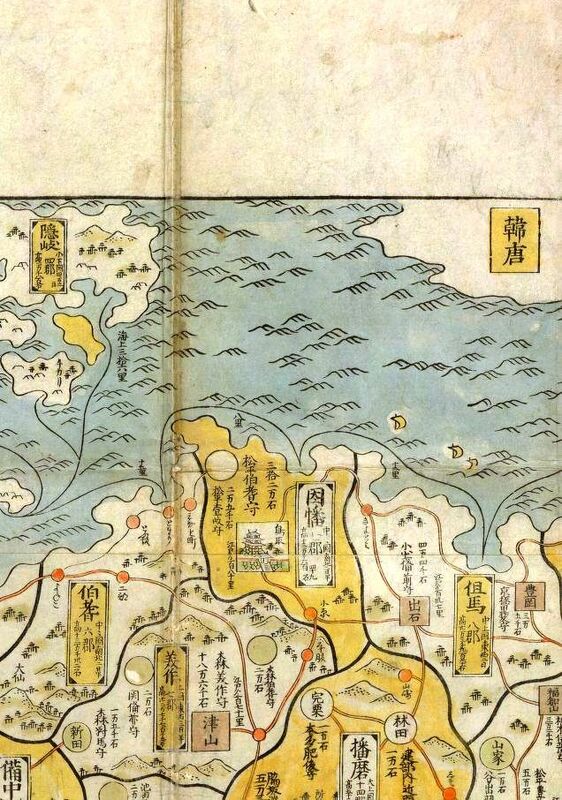 Next, we can see all of Japan’s mid 17th Century prefecture maps from the West side of Japan. If Ulleungdo and Doko were really being administered over by Japan in the 1600s they would have surely been included on at least one of the prefecture maps. However, as we see, this is not the case. 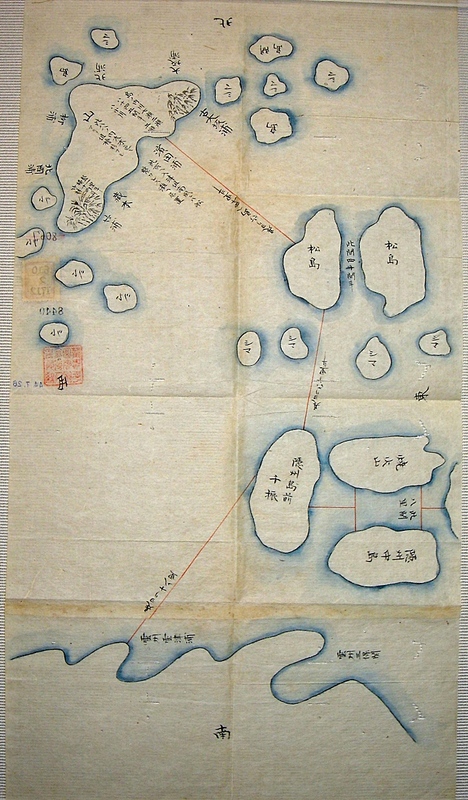 This tells us the voyages by Japanese nationals were not acts displaying any kind of sovereignty but rather individual clandestine acts that were permitted by the Shogunate to covertly harvest the Ulleungdo’s wealth of natural resources as Chosun maintained a vacant island policy over Ulleungdo. Early Chosun records show us that Korea objected to Japan’s trespassing on Ulleungdo as early as 1614. The two maps below are for georgraphical and historical reference. To the right is an old Japanese map showing the Japan’s western regions (written in Kanji). 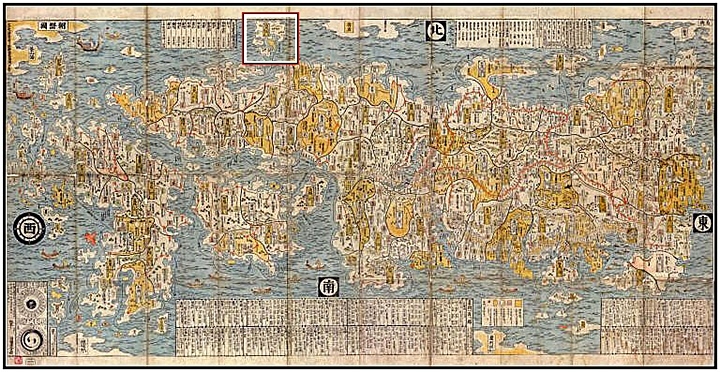 The corresponding Kanji characters can be seen on the 17th Century district maps to follow. To the right is a chart showing Japan and Korea with Japan’s West coast boxed in black. 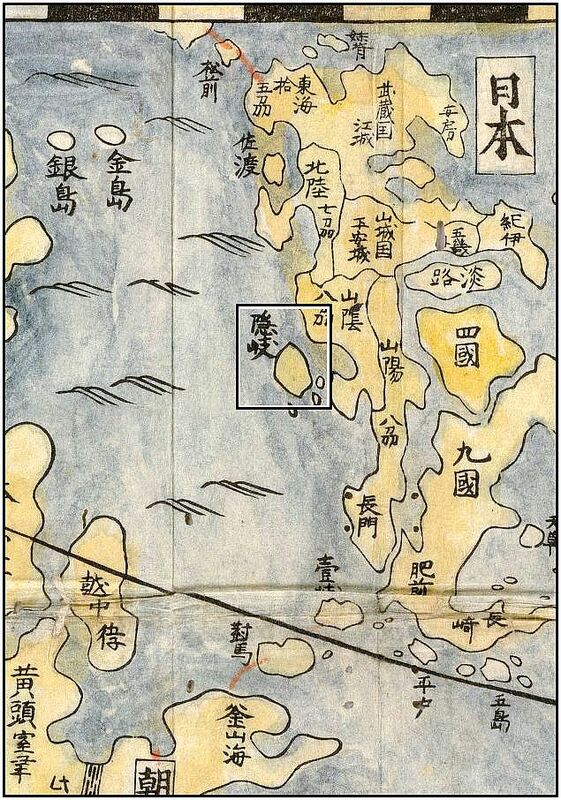 Japanese District Maps of Japan’s West Coast from the 1660s. These region maps from the 1660s are from Japan’s West coast travelling from West to East with Oki Islands on the right side. Neither Ulluengdo nor Dokdo are included as part of any of these areas. This concurs with Japanese national maps of this era and Saito Hosen’s report on Oki Island in 1667 that stated Oki Region was the northwest limit of Japan. 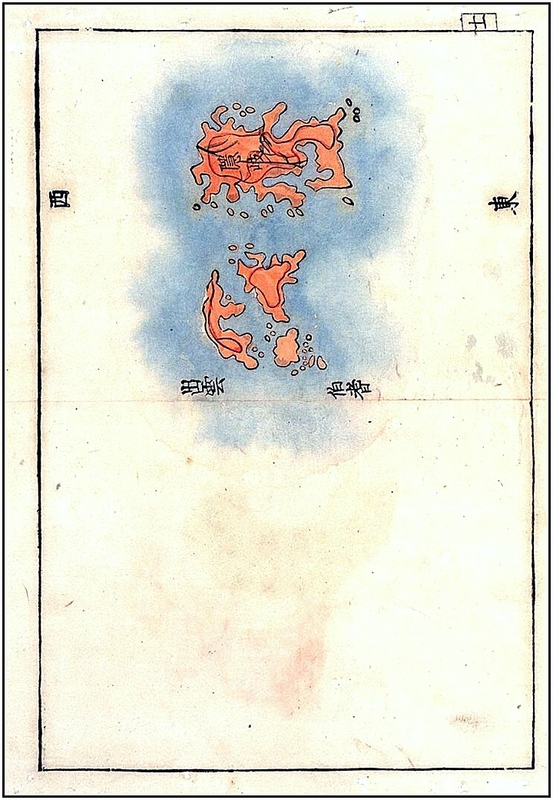 Above are mid-17th Century region maps of Japan’s West Coast, Ulleungdo Island and Dokdo were not part of any Japanese region at this time. Click maps for larger image. 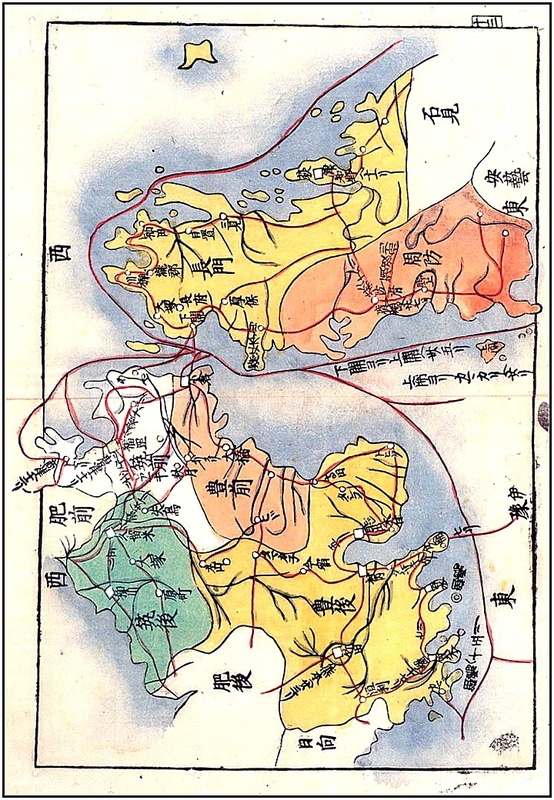 Japanese who assert that Dokdo is Japanese land based on the 17th Century voyages by local families are flawed in their reasoning when we observe maps of the region throughout this so-called “effective management” It is not possible that the Shogunate gave fuedual tenure to the Murakawas et al for lands that were not included to as part of any Japanese regional prefecture or district. A much more plausible explanation comes from other Japanese writers such as (Hideki Kajimura) who explain that the Murakawas and Otanis were simply issued voyage passes. We know the Shogunate strictly forbade Japanese nationals from foreign contact and voyaging to other countries without special permission. These annual trips were not acts of ownership over Ulleungdo and Dokdo. In fact, because voyage passes were only issued to those Japanese travelling to other countries, this proves that Japanese viewed these islands as foreign or lands separate from Japan. 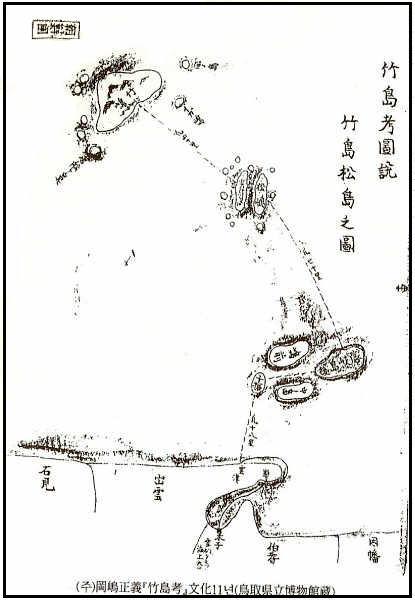 Japanese maps of the 17th Century support this theory. Also in Japan’s records Ulleungdo and Dokdo are always written as being Northwest of Oki Island and on maps located in the region is labelled as “Handang”. 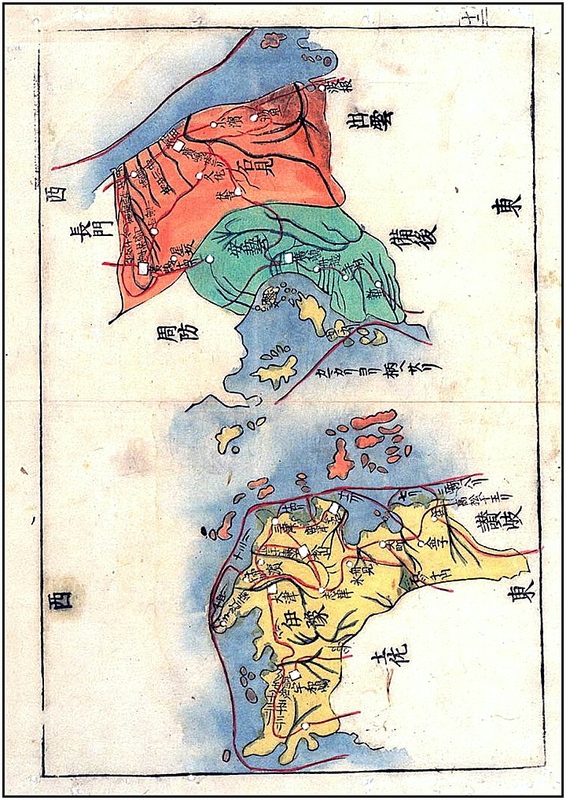 The Hoten map above shows Handang as being both separate of Japan and appended to Kangwan Province in Korea. Thus we know Ulleungdo and Dokdo were outside of Japanese territory and remained such until Dokdo was annexed in 1905. The method in which Shimane Prefecture incorporated Dokdo is also a telltale indicator of Japan’s relationship with the island prior to 1905. Had the nation considered Dokdo part of Japan since the voyages of the Murakawas, they would not have declared it as “ownerless” or “terra nullius” when they annexed Dokdo. In short, the clandestine and illegal activities of a few fishermen were not acts displaying sovereignty over Ulleungdo or Dokdo even in the eyes of the Japanese themselves.